Ranks #16 on GoDaddy’s WP Hot 100 list! 80,000+ Active Installs. With a robust framework, ready-to-use sections for Team, Testimonials, Services, Contact Form & others – this multi purpose Responsive WordPress theme has everything you need. Complete RTL Support – the sidebar location changes accordingly. Responsive Theme – is based on an intuitive foundation with a fluid grid system that automatically adapts your website to mobile devices including smartphones, tablets and desktops so your blog or small business website looks good on any device. This theme is aptly named Responsive Theme – because that is the main focus of this theme, to make sure it is fully responsive and adapts to any device seamlessly. We understand the importance of WordPress responsive themes and have ensured all of our themes are truly suitable for all mobile devices. There are so many responsive theme examples out there, you might find it hard to decide which one to download. 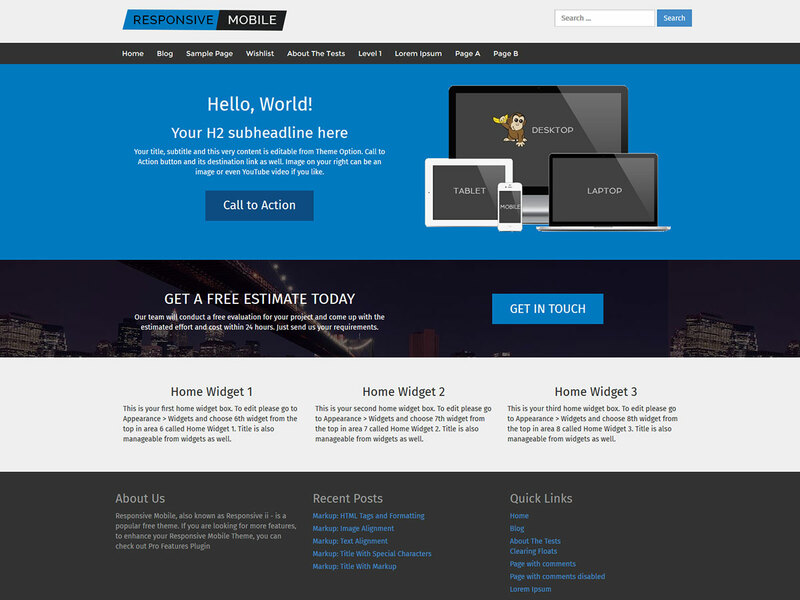 However, with this free and Responsive WordPress Theme, your site is safe. It has 80,000+ active installs at the moment – so we know how important and loved this responsive theme is. Responsive is the best Child-Theme friendly WordPress theme out there – thanks to its robust framework and flexible layout. Check out these Responsive Child Themes – Responsive Business and Responsive Blog. The Responsive theme was originally developed by ThemeID, now taken over by CyberChimps. Our Responsive theme sure knows how to get around. This time it’s been spotted on the water in Wisconsin. First Class Dog Training is an excellent example of how starting with a purpose, and then a creative vision, and then having a good theme like Responsive can make for a fun, successful site. The Stajnia Kniok site is a fun, friendly example of how the Responsive theme can be adapted to reflect the personality of your people and your business ! What is the meaning of Responsive Design? The term “responsive” is everywhere these days in the world of web design. But this term is more than just a buzzword. It represents an entire shift in the way of thinking about how to build and display sites. Responsive web design is an idea that’s been around since 2010 when Ethan Marcott, in an article for A List Apart, first came up with the term. Only three years later, Mashable has called 2013 The Year of Responsive Design and it has become the industry norm. Before you get to how important responsive design is, you need to understand what it means. Responsive design simply means is that content is displayed slightly differently depending on the size of the screen. Smaller screens, such as smartphones, have the content displayed in a way to make it easy to read and easy to navigate using touch controls. Some content that could require a lot of bandwidth to download may be left out. Medium sized screens, such as tablets, might rearrange things a bit and allow for a few more things to be included on the page. Desktop sized screens used to be the norm, and many sites continue to be focused on this type of display. But even desktops are not a one-size-fits all since displays can vary in size and resolution. And what about multiple monitors? Not to mention things like large screen TVs! You need too plan your design so that your website adapts to any device – irrespective of its screen size or resolution. A Responsive Theme is one that adapts to all mobile devices and desktops – and modifies elements based on the resolution of the screen. For example, certain images might be hidden if the device is too small to show them. At times, the menu of a website looks different or collapses automatically on small phones. To design a website to be responsive takes some planning and decision making up front. The best approach is a “mobile first” approach where you start with the content and then determine how to best display it when sized for the smallest screens. Next is to choose breakpoints (defined largely by the width of the display) where the design will change, and then adjust the site layout at that point. With each larger breakpoint new content can be added or rearranged to best fill the available space. Here’s a handy responsive design checklist – full of tips for those of you just starting out. Responsive design is an absolute must at this point and should be something you look for when choosing a theme. The good news is that all of CyberChimps WordPress themes are built this way. CyberChimps’ Responsive theme itself is a great example. When browsing through WordPress Themes, responsive design is super-important and is an absolute necessity. Emil Uzelac created this theme and released it on 16th March,2012 when the concept of responsive design was relatively new. It has had an upward popularity graph right from the start – crossing 1 million downloads in Jan 2014. More recently, a few premium child themes have been launched to help upgrade this free theme – Responsive Business, Responsive Blog.